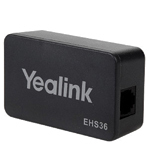 This is the Yealink EHS36 wireless EHS adapter for both Plantronics, Jabra/GN Netcom and Sennhesier Wireless Headsets. This adapter allows EHS remote answering from the wireless headset. simply attach the Yealink EHS36 to the EXT port of the phone and, effectively `plug and play’ giving you control of your Yealink phone and the ability to answer and hang up calls remotely.